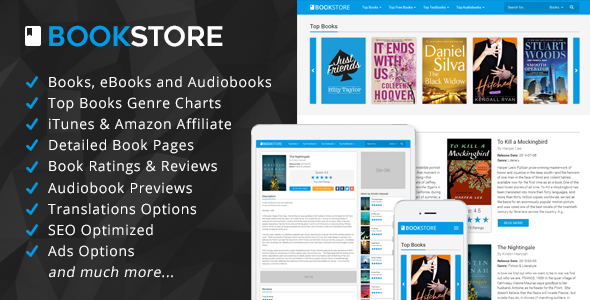 Discovering great books has never been this fun, with the BookStore script you can have an instant and fully automated books affiliate website filled with the latest and best selling books, ebooks and audiobooks. 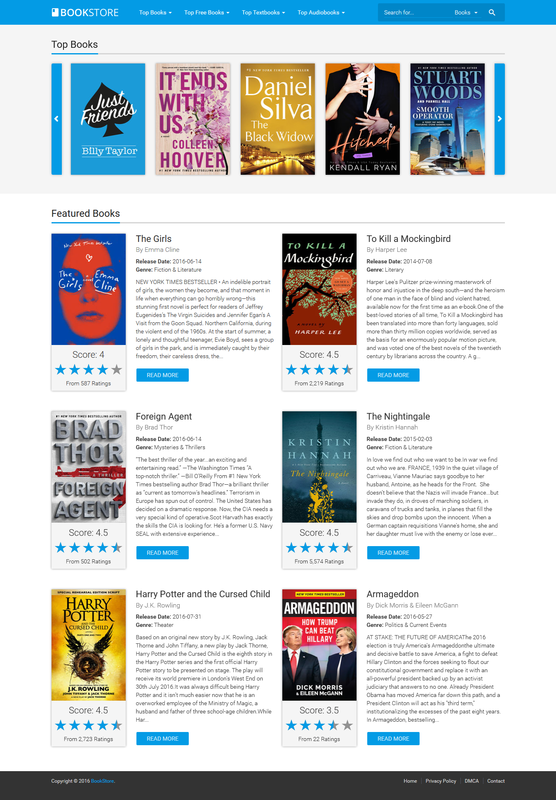 With use of the iTunes api the BookStore script makes it possible to have a fast, lightweight and huge book store website that is always up to date with the latest and most popular books. 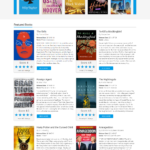 The BookStore script has a modern and responsive design, the homepage features a scrolling carousel showing the top selling books that you can even select a specific genre for if you want and also a featured books section, you can select which books you want to have featured in the site settings, the homepage is also being cached for faster loading. 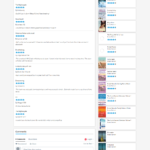 The users can browse the BookStore in four categories; top books, top free books (ebooks), top textbooks and top audiobooks, you can also filter the results by genre or use the search function to find any book or audiobook. Single book and audiobook pages contain detailed information about the book like a description and customer ratings and reviews it has received and optional iTunes and Amazon affiliate buttons. For audiobooks it also provides a 90 seconds audiopreview. 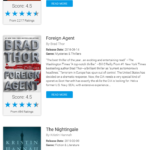 If available it will also show sections for the iTunes users reviews and other books from the same writer. 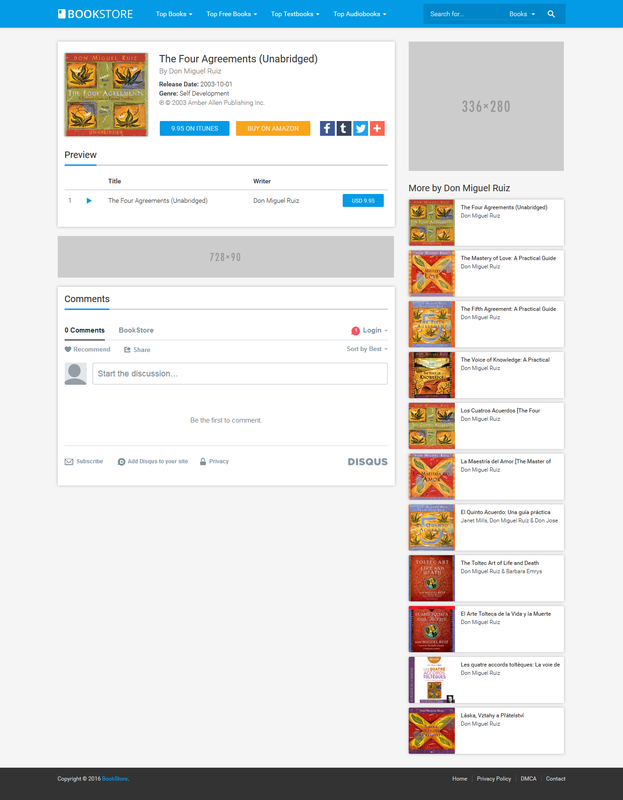 There is an optional Disqus comments section and also AddThis social sharing buttons and advertisement spots are in place. 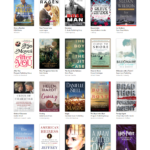 You can select to use the iTunes store for your own country to get the most popular books in your country, you can see the entire supported country list here. Combined with the BookStore script translation settings you can easily transform your entire website into any language that you wish. For iTunes affiliates and Amazon affiliates the BookStore script offers a great way to promote books and earn a commission on revenue generated by clicks initiated from your website, just input your affiliate id in the settings file and all the links to iTunes or Amazon will have your affiliate id attached to them so your sales will be counted. Do not worry if you are not an iTunes or Amazon affiliate, with different sizes of advertisement spots in place you can promote any affiliate program or ad company that you want. All pages are SEO optimized with OpenGraph meta tags and have a search engine friendly url structure, perfect for search engines like Google to crawl and index your website. 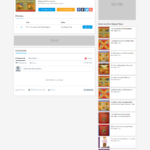 You also have the option to add text to create your own unique page titles for improving search engine results. The modern and responsive design is making it also easy for mobile, desktop or tablet users to view and navigate the website. Tags: affiliate, amazon, api, audiobook, book, ebook, itunes, jquery, php, responsive, reviews, search engine, seo. We create beautiful premium WordPress themes and PHP scripts that show strength in both design, functionality and usability. When you buy a WordPress theme or PHP script from ArmorThemes, you get awesome responsive design, professional code, usability, monetization options, great support and theme updates all for a decent price.